Most of us remember the hit 90's sitcom 'Seinfeld.' Each character on the show was hilarious in his or her unique way. However, there was a character who despite having a stoic appearance was also funny. The character I am referring to is of course 'The Soup Nazi.' This chef served the best soup in town which brought in crowds. However, his martinet demeanor along with a display of stoicism made him a formidable individual. Those patrons who did not follow the established ritual of requesting soup were denied it by 'The Soup Nazi.' His famous phrase was, "No soup for you!" To my logical mind, this did not sit right and I kept asking for clarification hoping they were astute enough to see their fallacious way of thinking and poor wording of the rules. Logically speaking, when we create a Facebook account, we create a profile that identifies with our person or the self. Therefore, whenever and wherever we post or comment, we are in effect 'promoting the self.' These 'Catholics' did not seem to understand this and kept insisting something that was fallacious and devoid of logic. 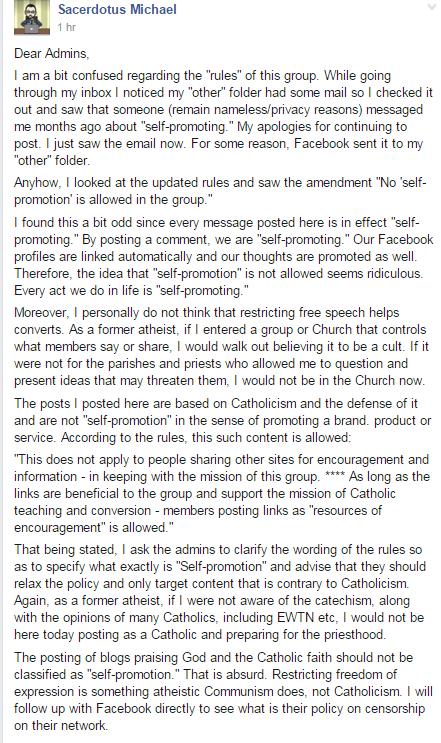 One member named Laura Hamil even insinuating that my post was 'trolling.' It seems Laura Hamil has given deaf ears to Pope Francis' call for mercy and meeting people where they are at; or perhaps she does not have the intellectual capacity to distinguish between a question and trolling. Shortly after Laura Hamil posted the above comment, I was blocked from the group. So much for 'mercy' right? What a sad state do these 'Catholics' live in where a simple question asking for clarification and the offering of some friendly advice given from experience can get one blocked by a 'Catholic' deacon and laypeople. 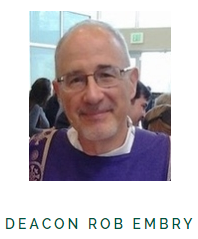 Someone needs to remind the good deacon that he plays a public role in representing the Church in a quasi-fashion. I can assure anyone (speaking as a convert from atheism) that if you block or treat someone who asks you questions as a pariah, you have lost that someone. You can forget 'bringing' him or her to the Church. 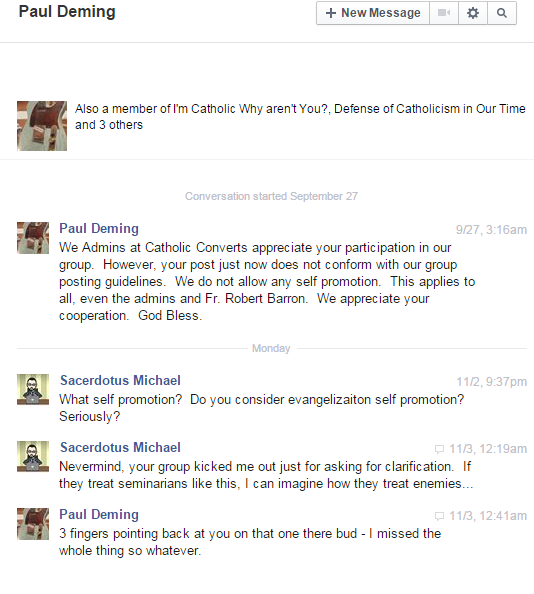 Any Catholic, ordained or not must be careful with how they present their faith. The world is watching and one slip up will bring on criticism and doubts. 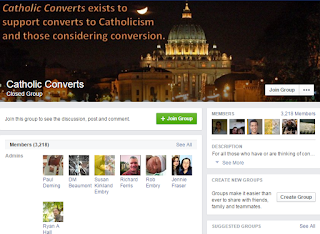 The events that transpired on Facebook is one of the reasons why I think the monitoring of sites, blogs, social network groups, podcasts etc by bishops run by those who claim to present Catholicism is necessary. In today's world of technology, many young people will encounter religion online before they encounter it in a Church, Mosque or another kind of temple. 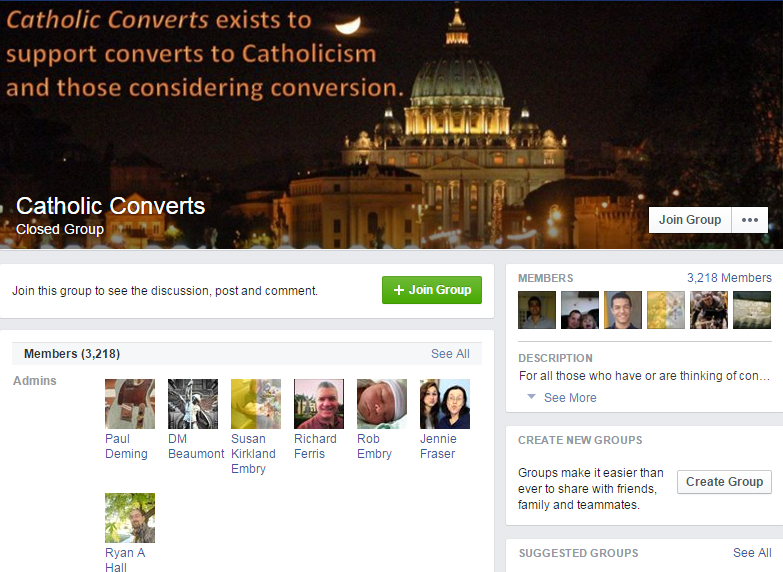 Groups such as 'Catholic Converts' which prohibits free speech and blocks anyone simply for asking for clarification will scare away many people from the faith. Freedom is extremely valued in the world of today. 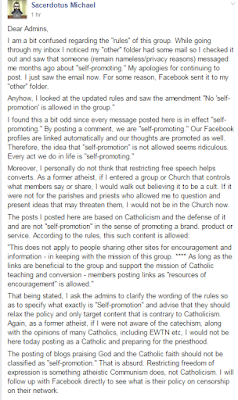 That being stated, no one is going to want to join a religion that restricts it based on the impression a Facebook group, deacon or layperson gives. 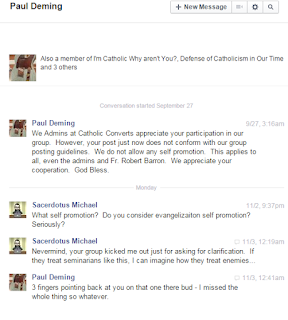 If these people block seminarians, imagine how they treat non-Catholics! I write this post not to shame anyone but to 'admonish' those whose thirst for control and power has let the aforementioned get the best of them.